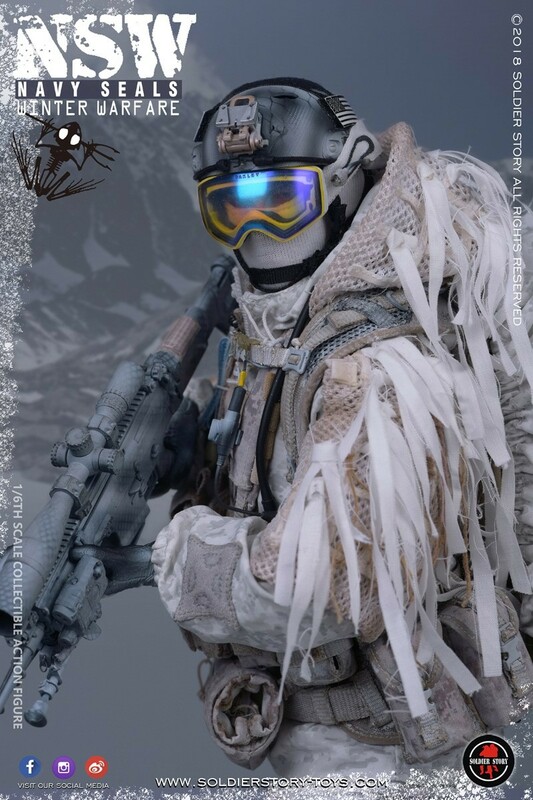 This one is very impressive. 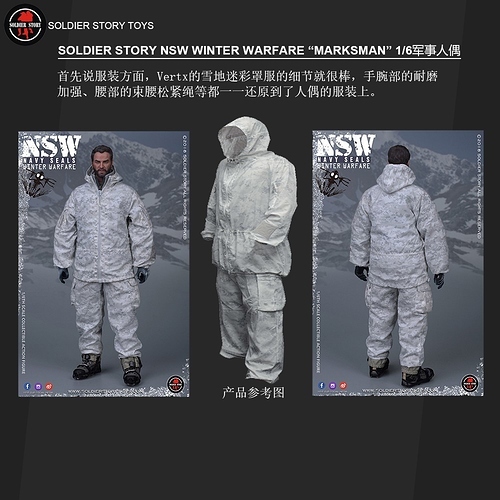 If I would compare it to the EXPO NSW, this one is far superior. 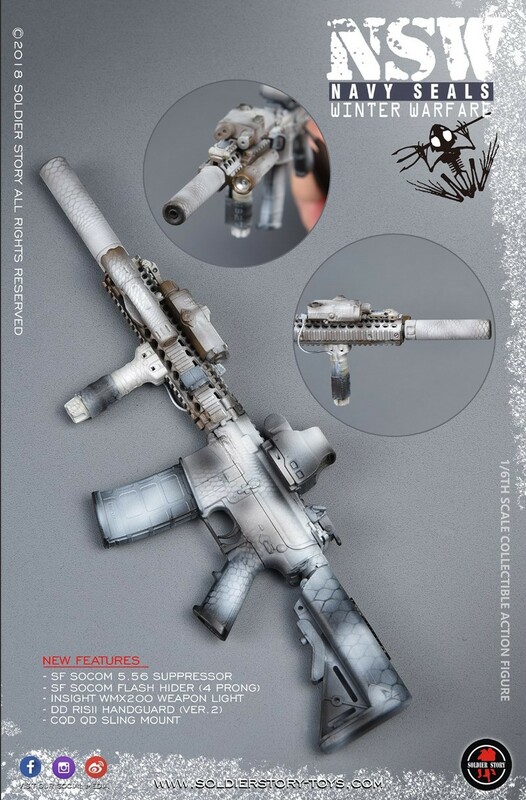 Both rifles have nice additions next to the snow camo. 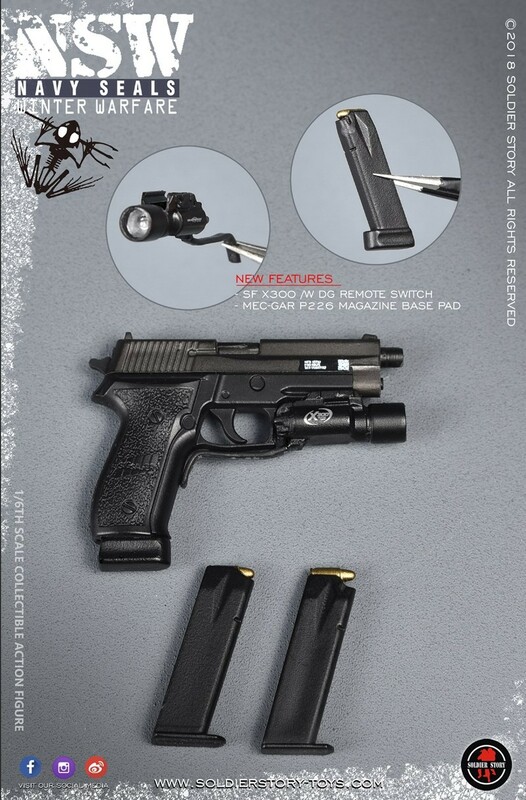 Also the SIG 226 is just great! 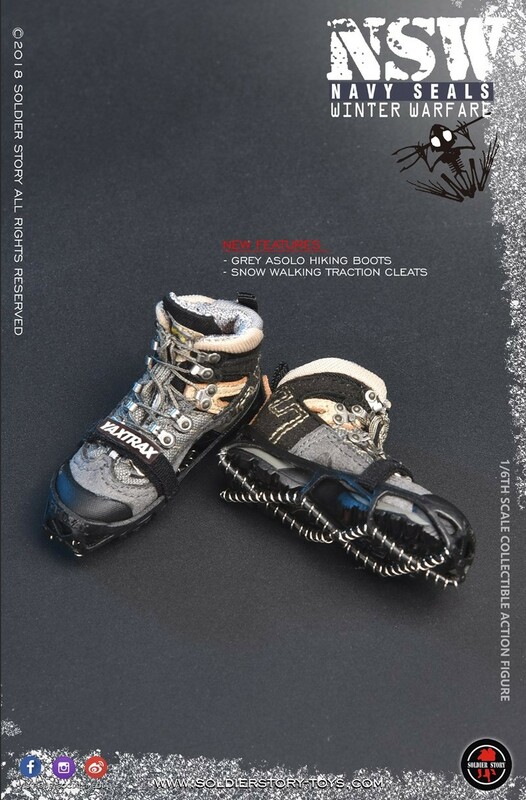 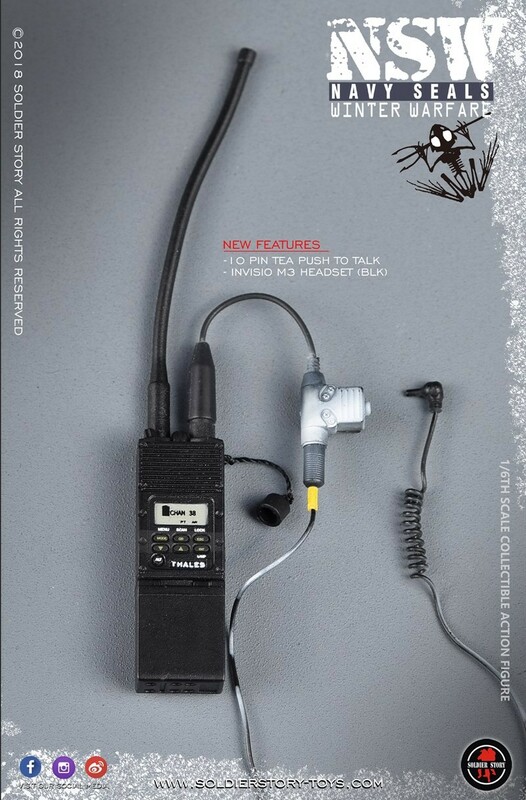 I think @AdamC will give us a MSRP soon. 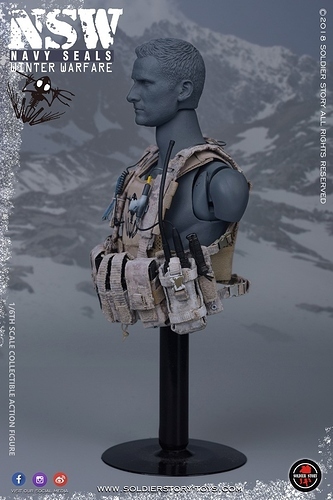 Lots of parts for a mannequin to display! 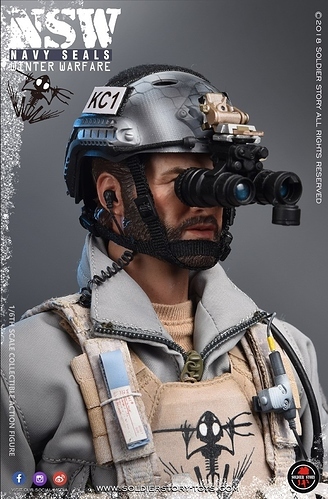 Unfortunately, no pics of the bare muzzles. 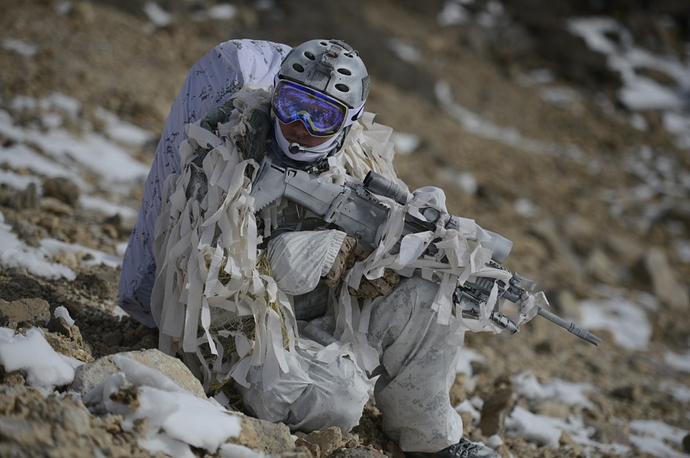 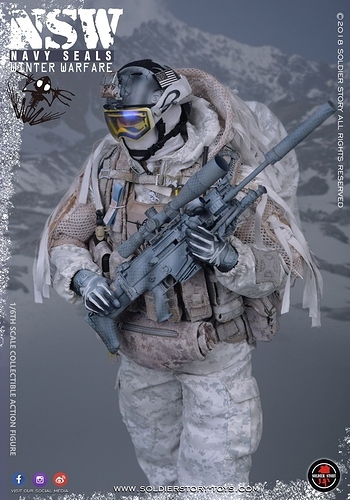 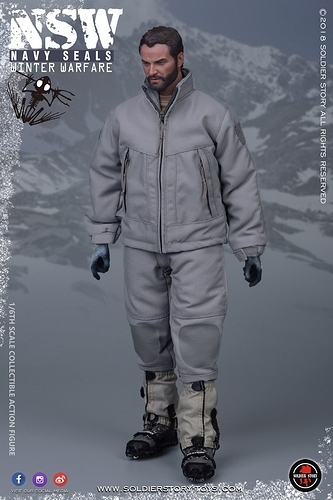 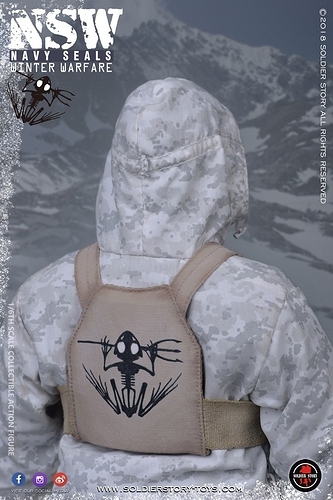 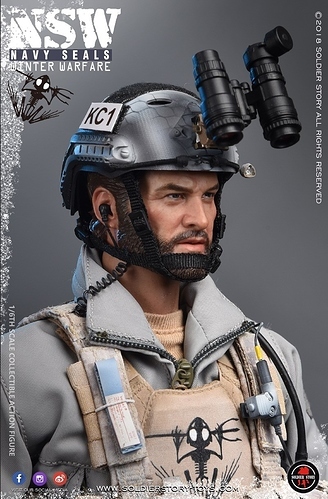 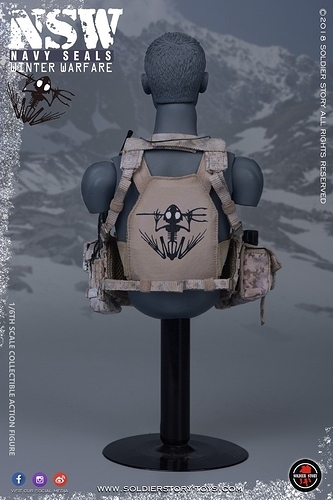 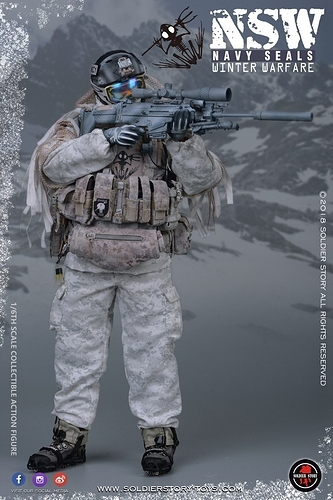 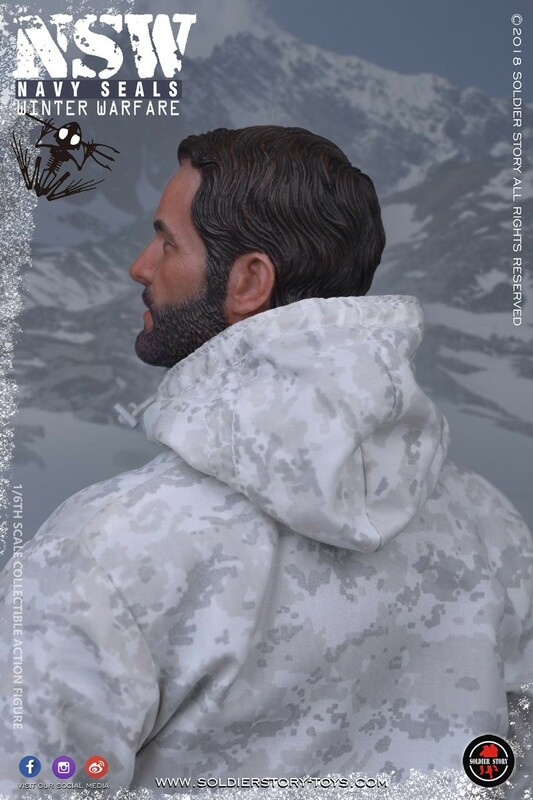 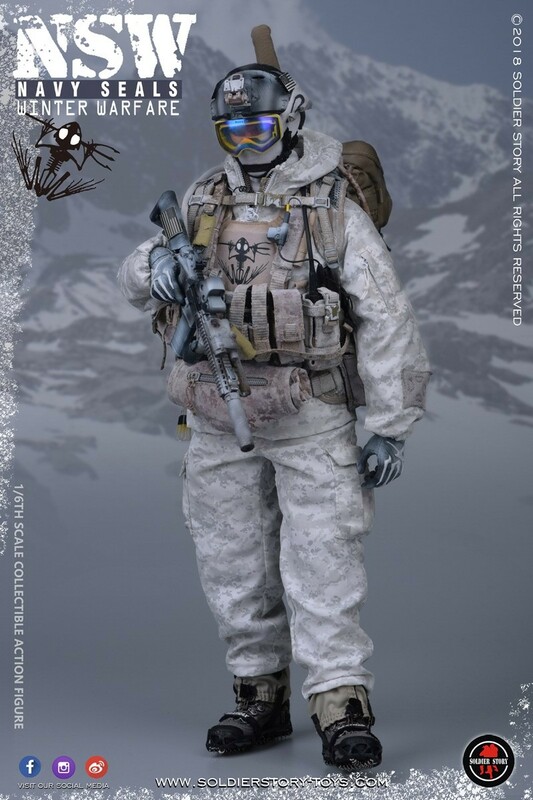 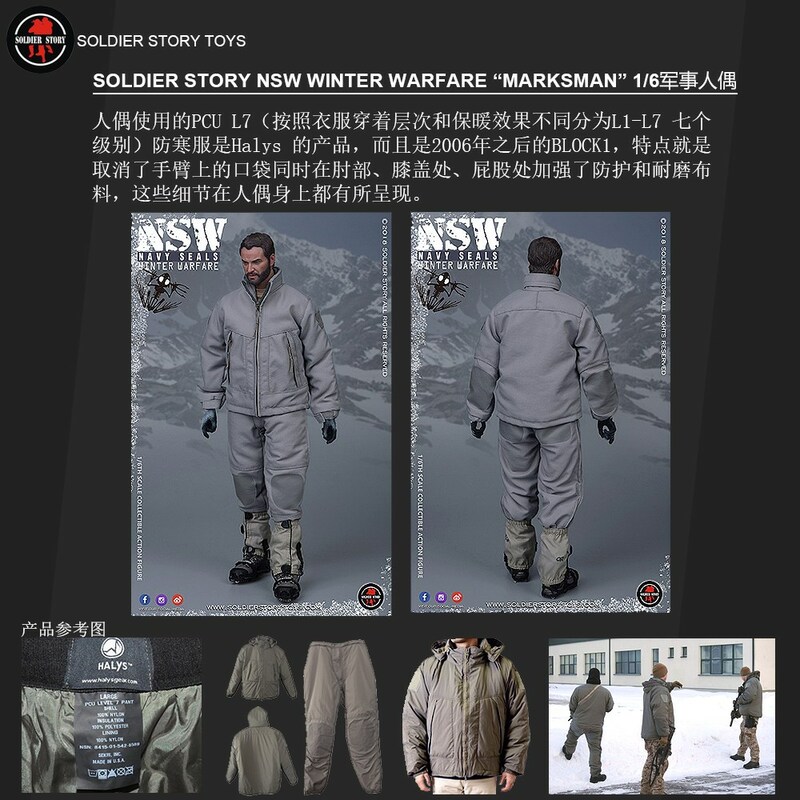 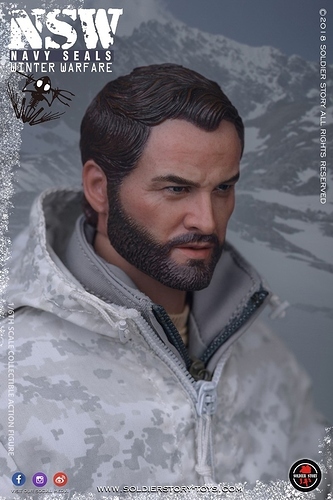 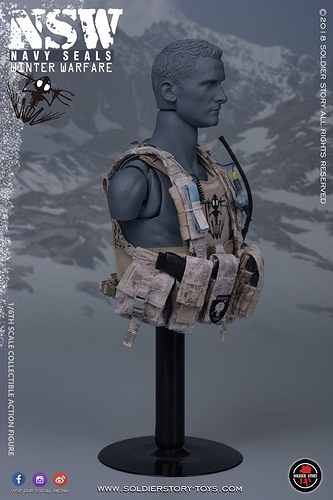 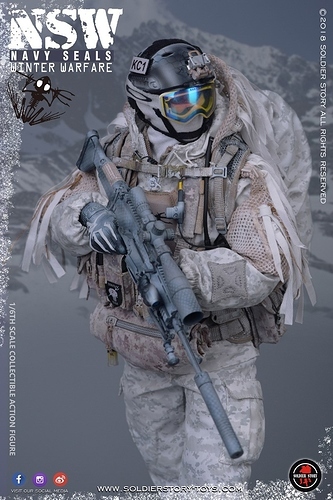 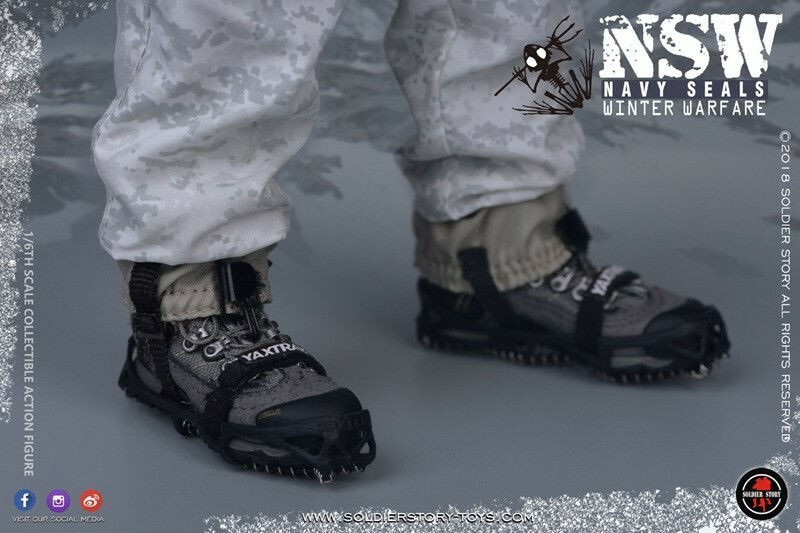 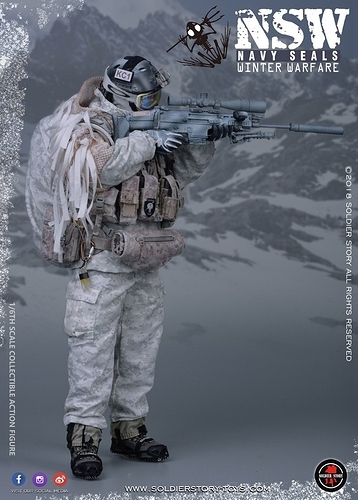 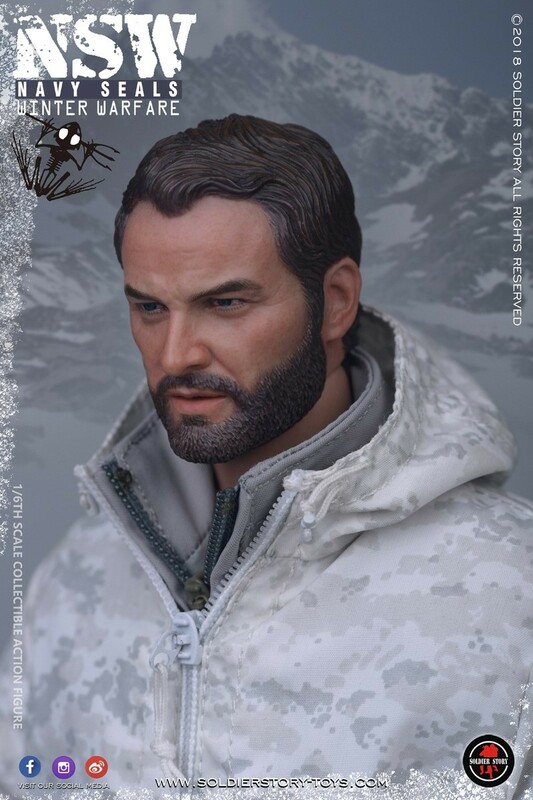 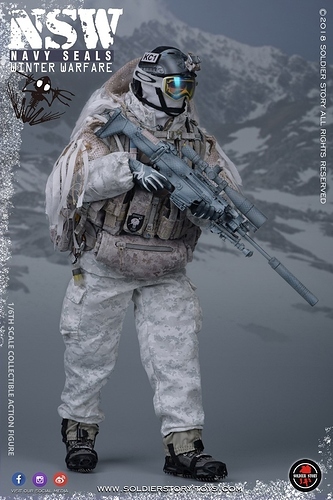 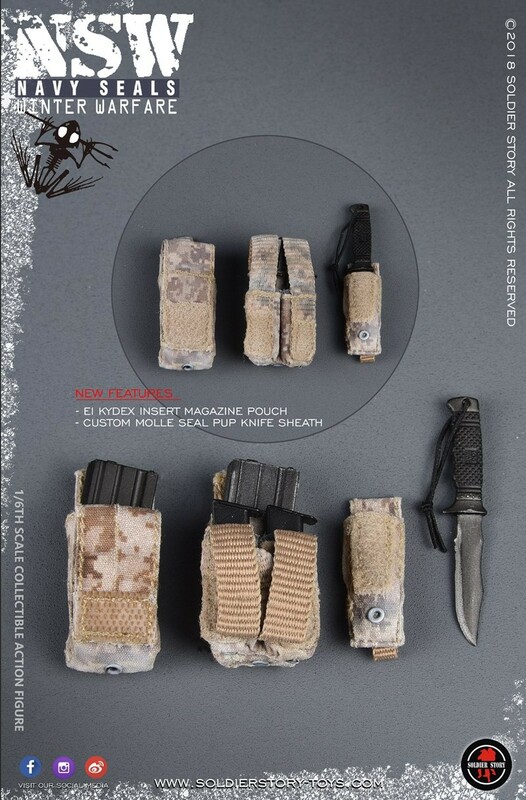 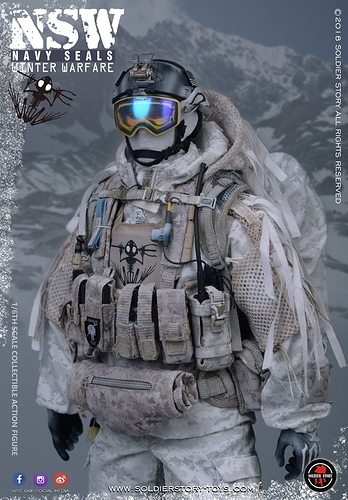 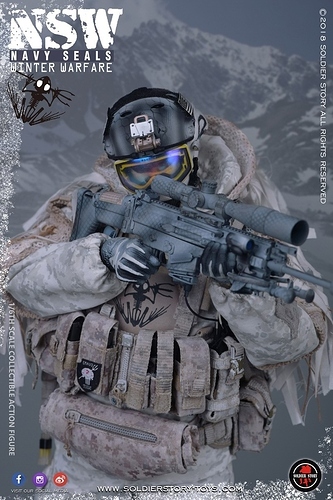 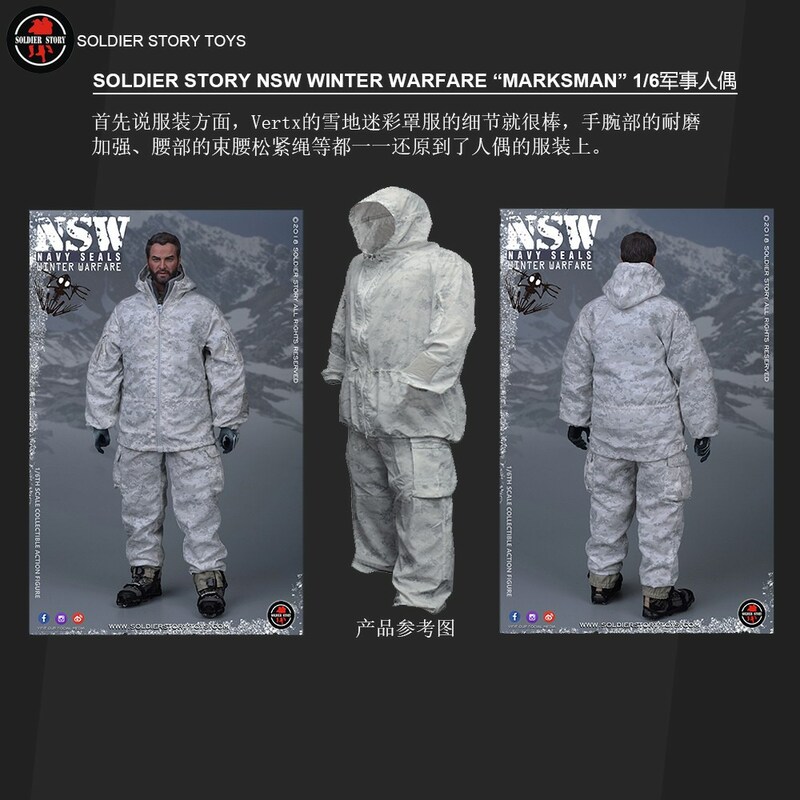 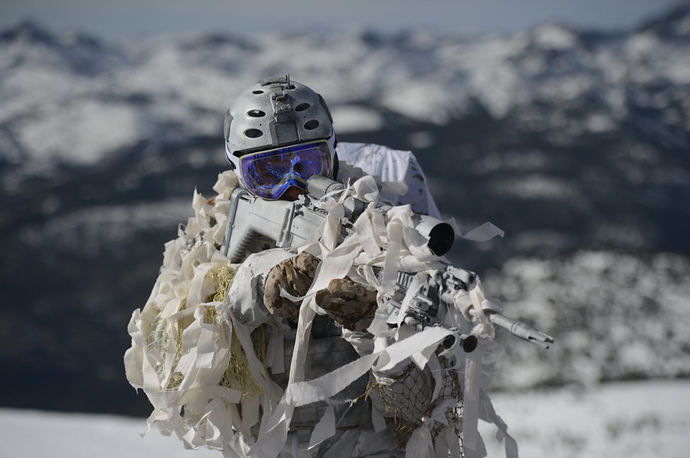 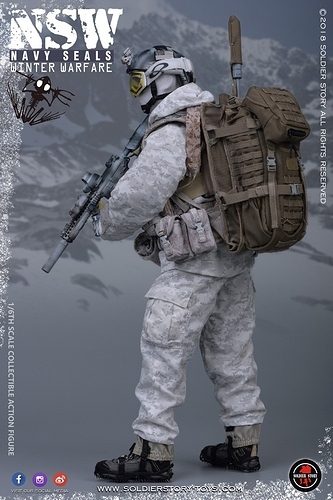 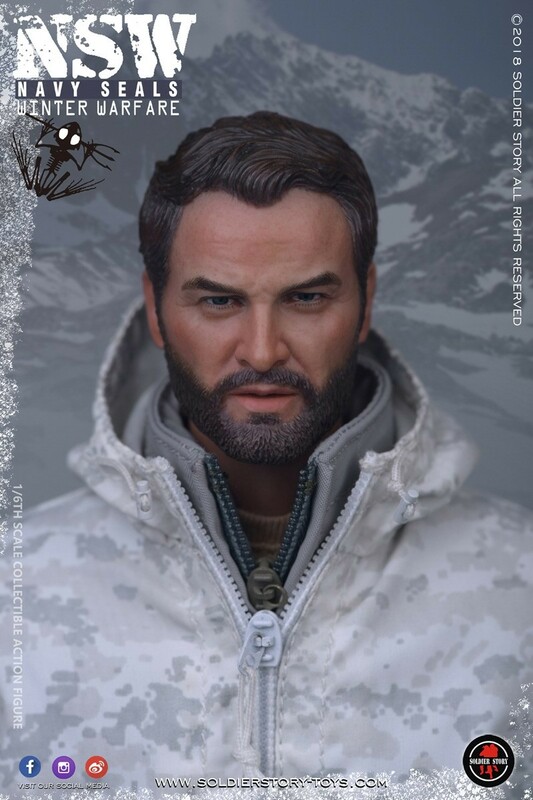 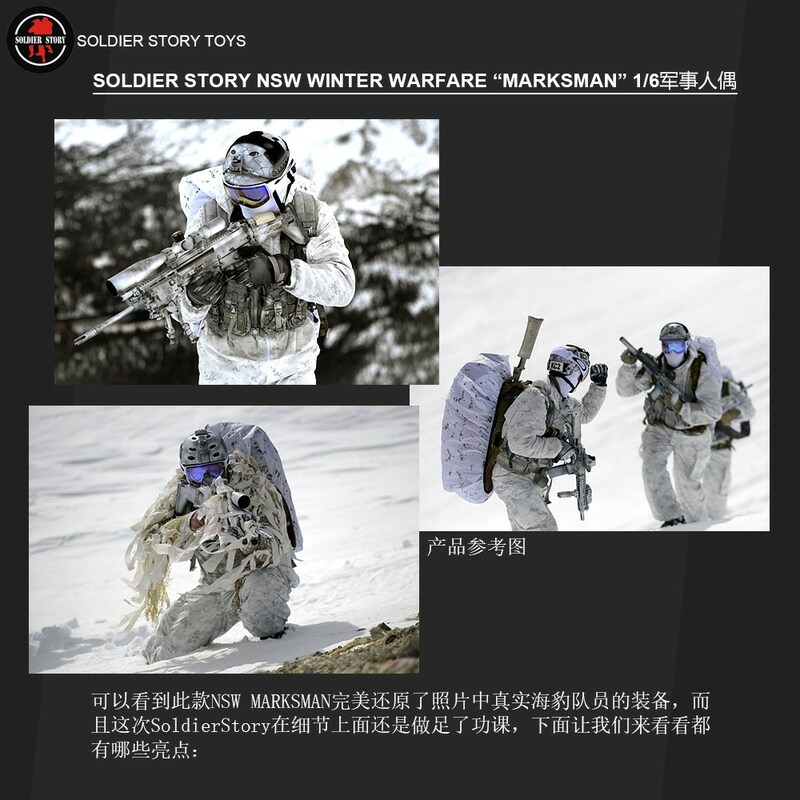 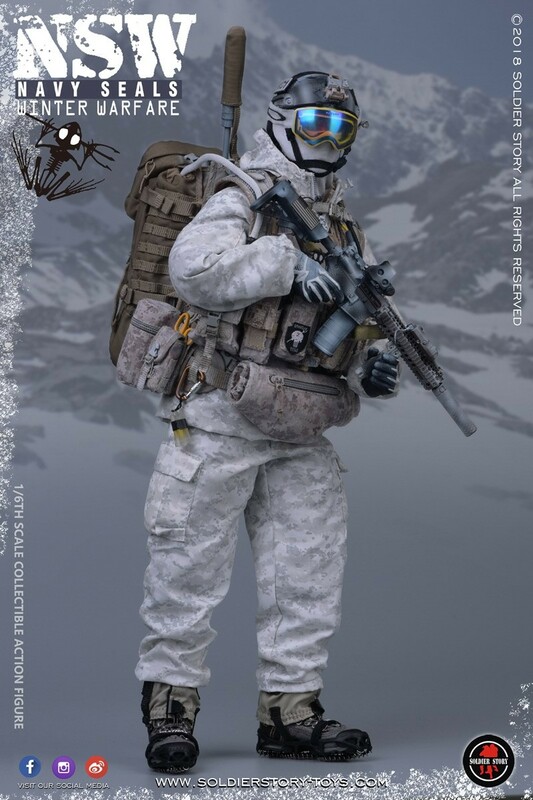 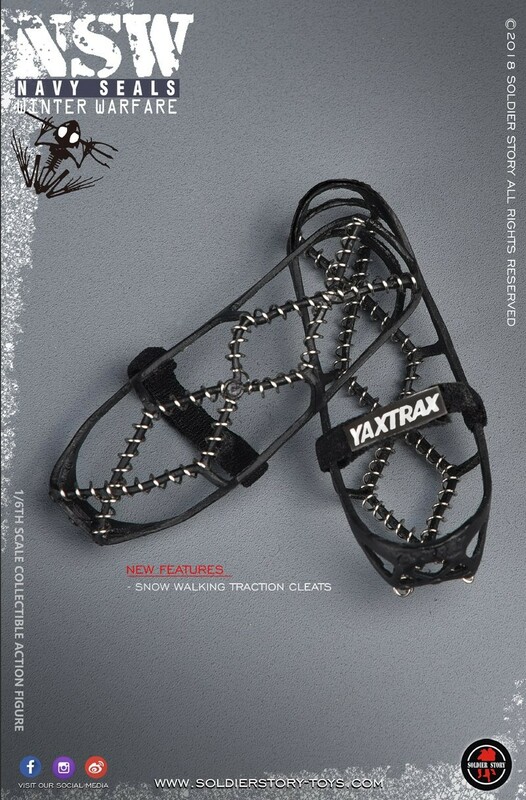 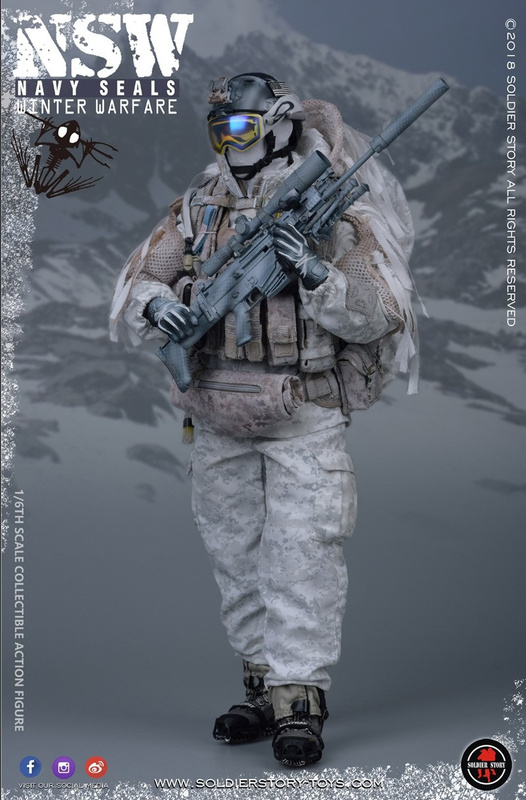 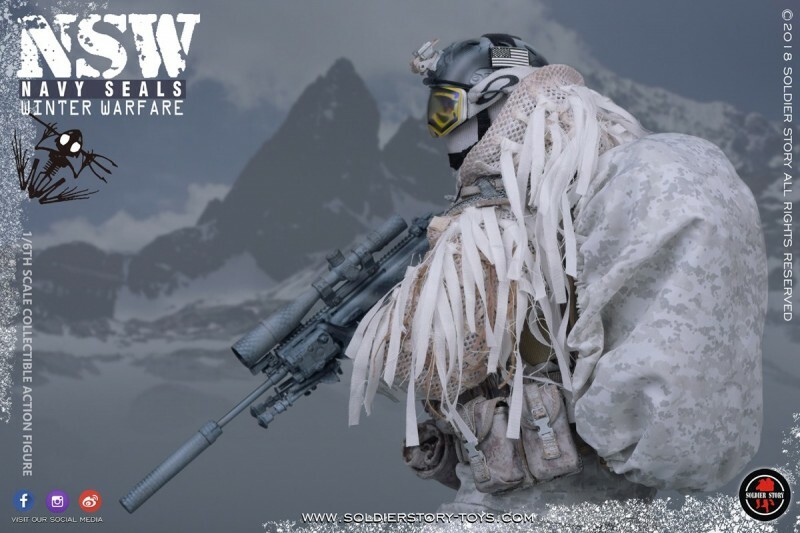 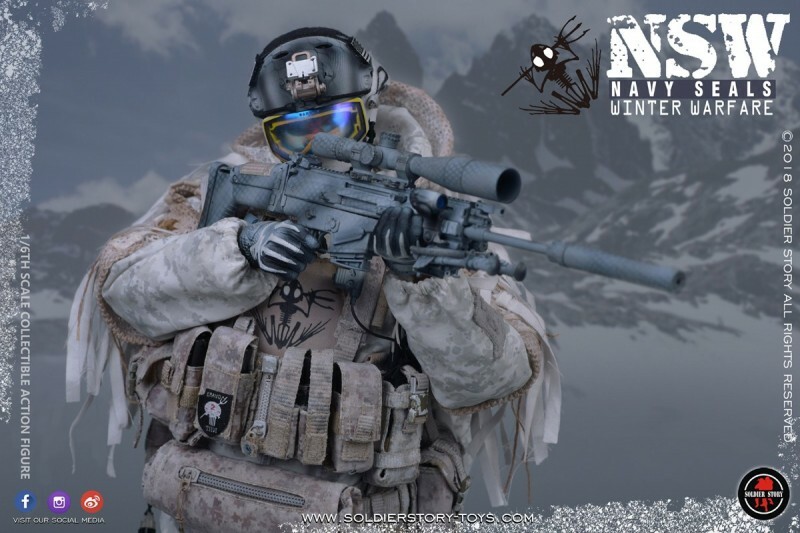 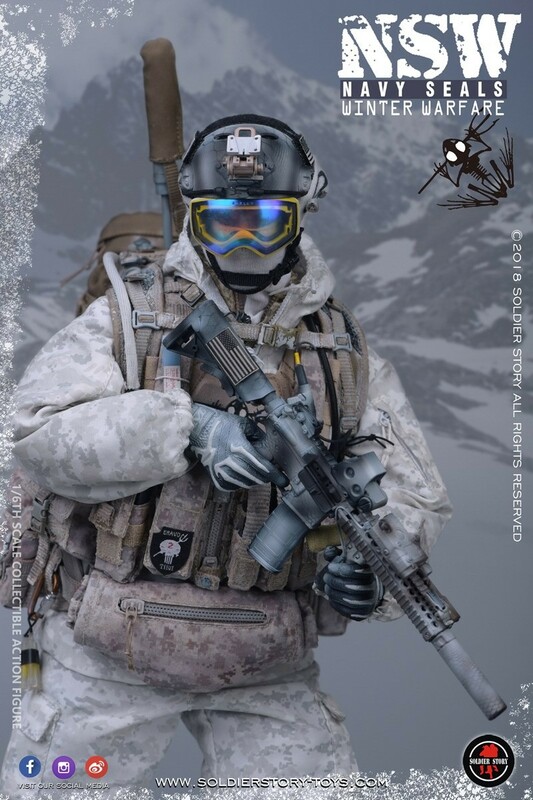 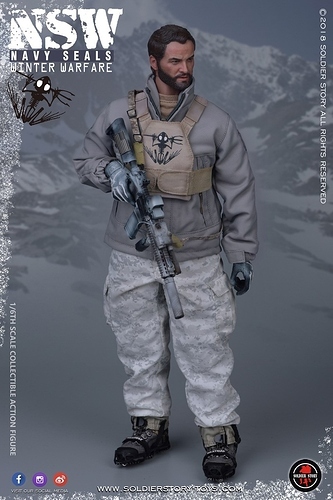 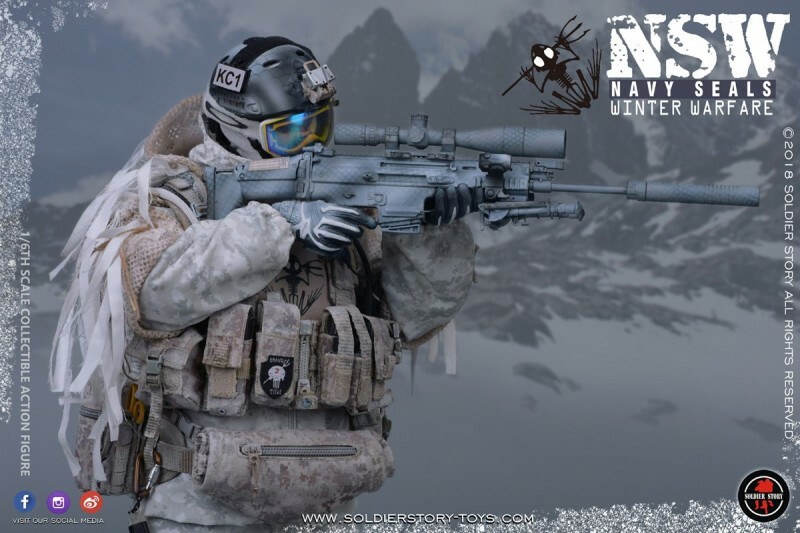 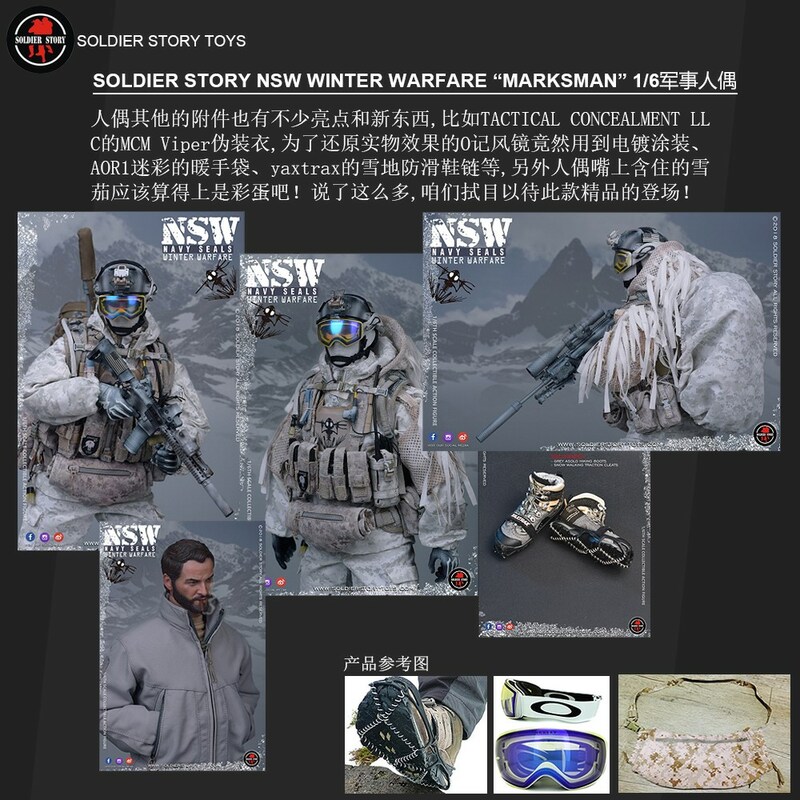 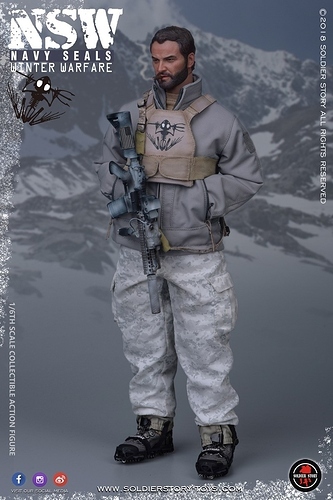 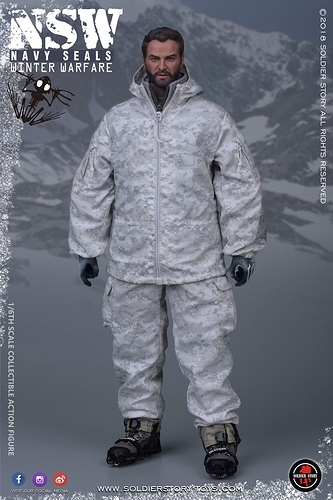 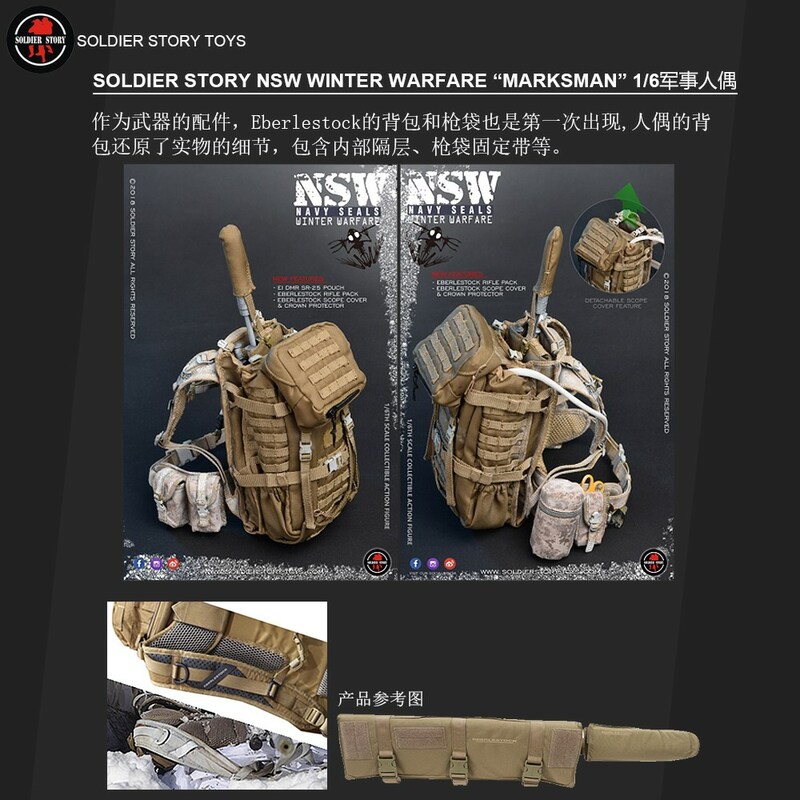 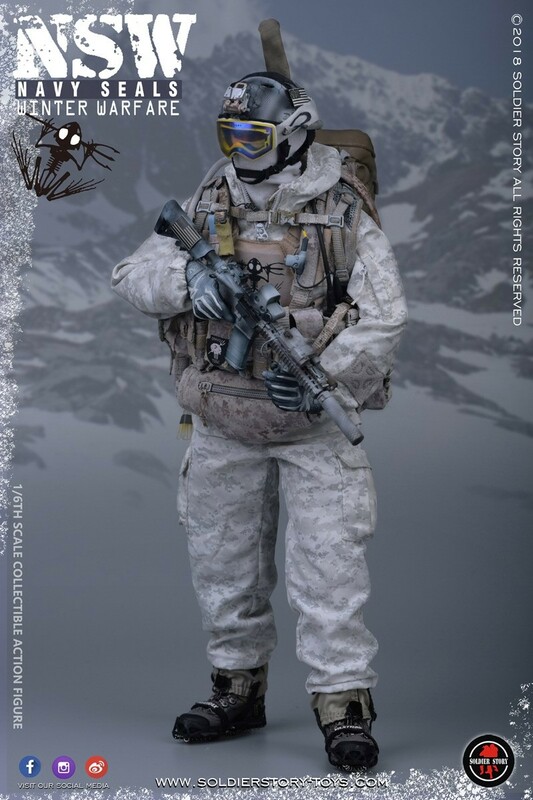 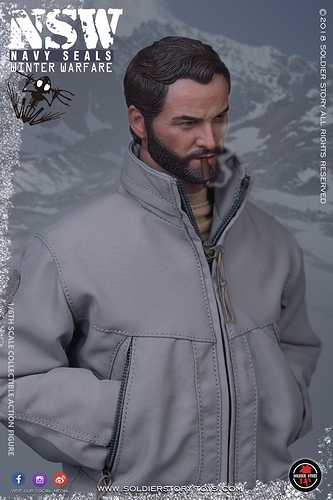 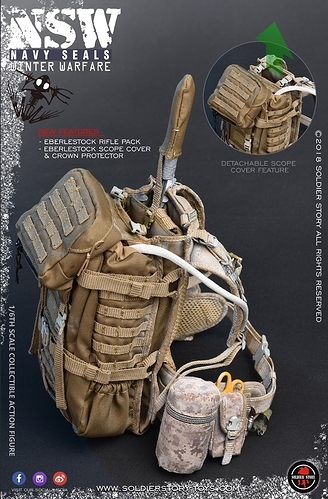 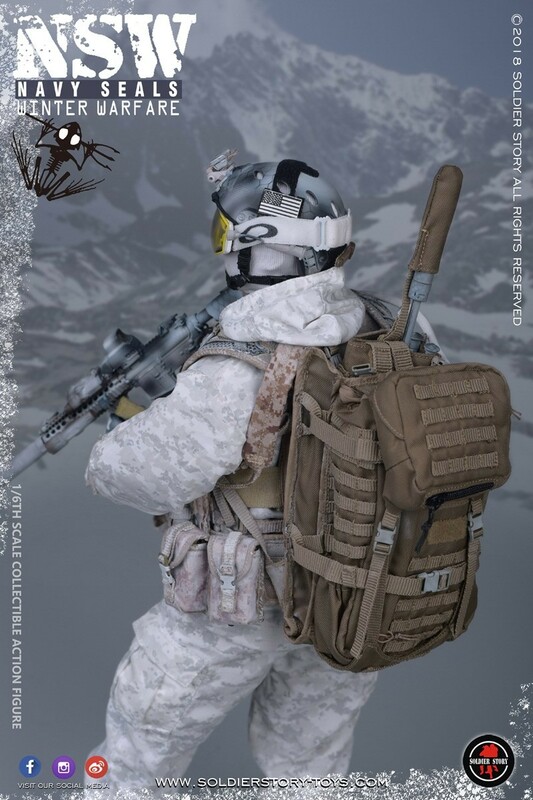 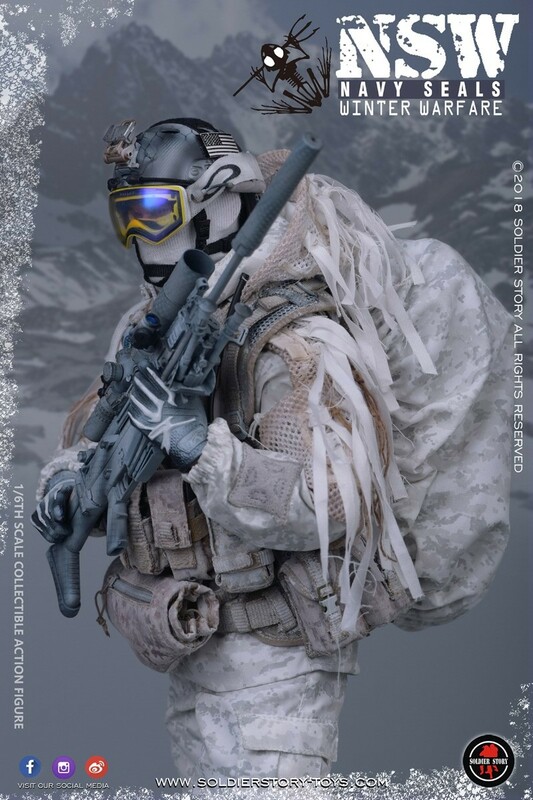 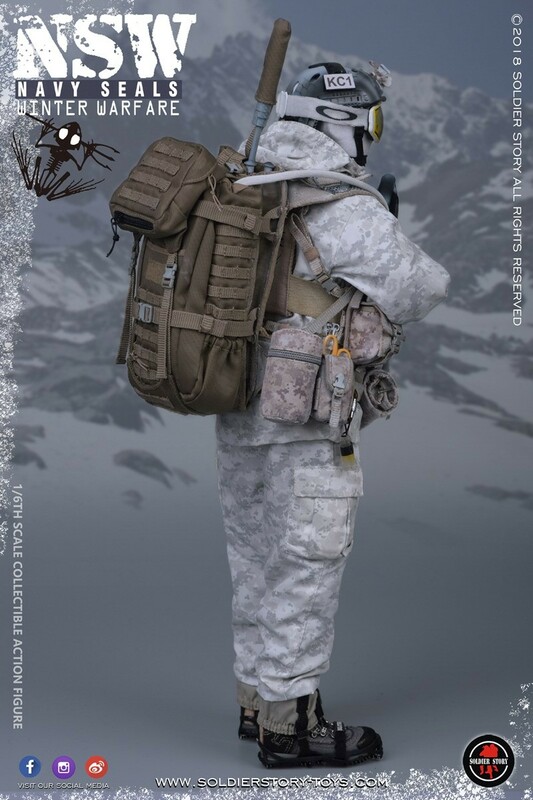 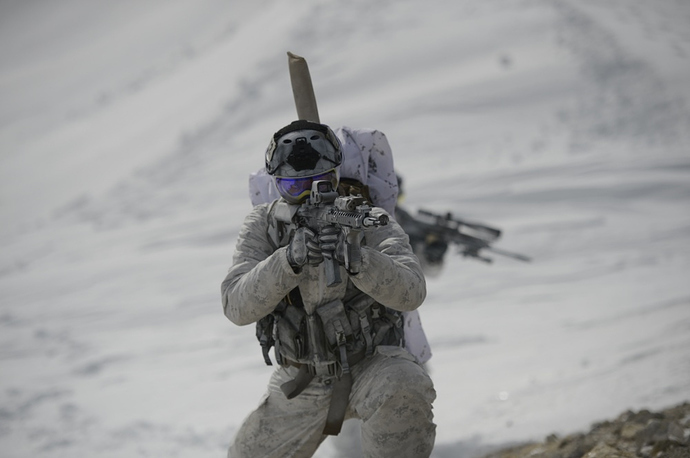 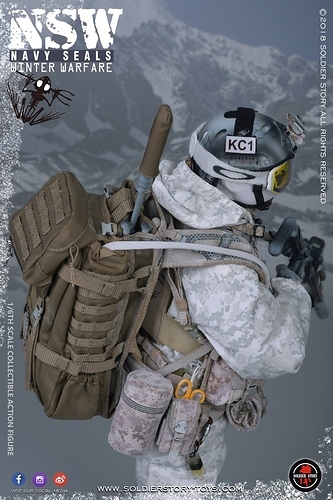 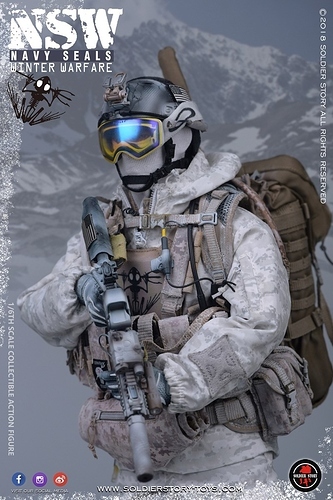 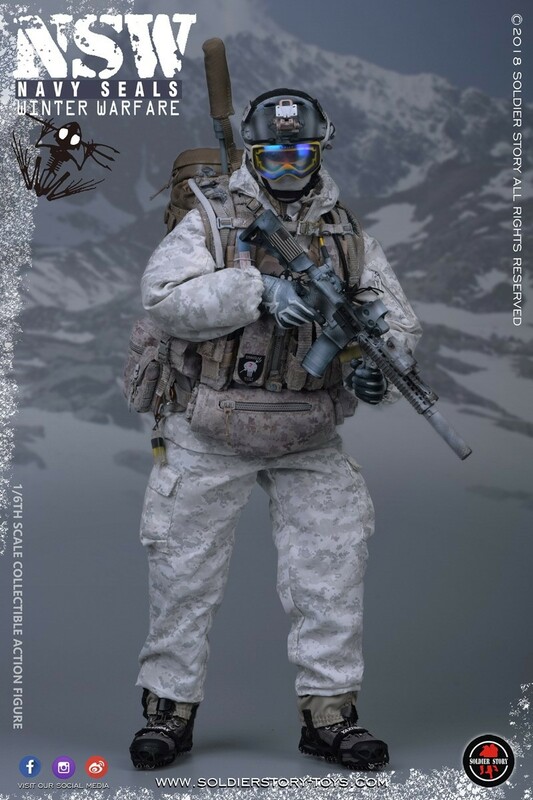 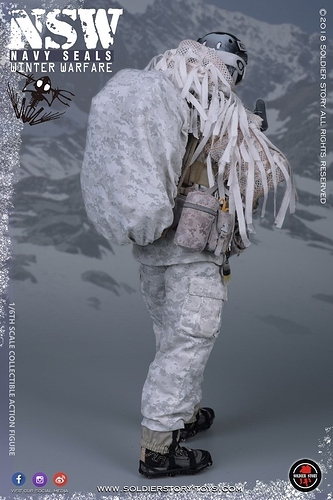 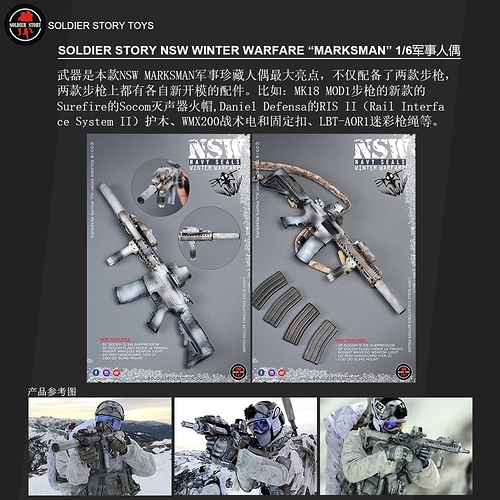 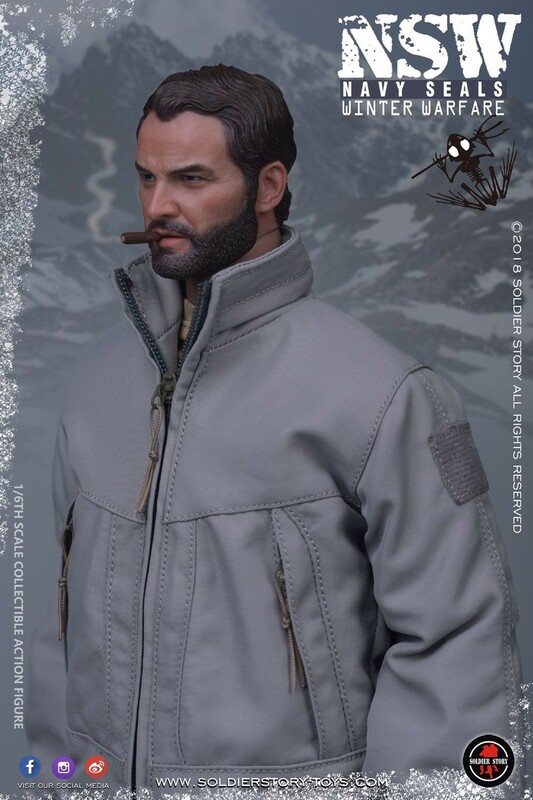 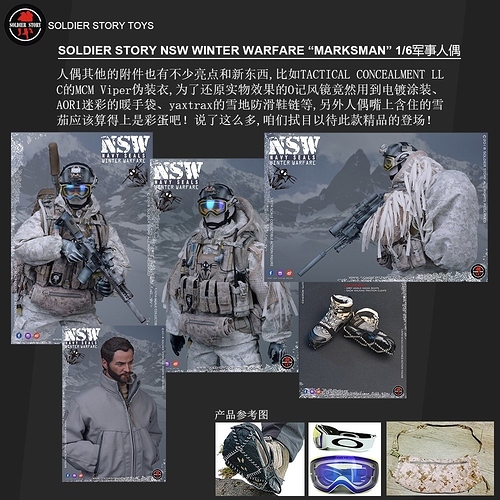 However, this is quite possibly the best winter warrior I’ve ever seen, and although I’ll pass on the boxed set there are quite a few pieces I’ll definitely be getting from this one: head w/body for sure, chest rig & BA vest. 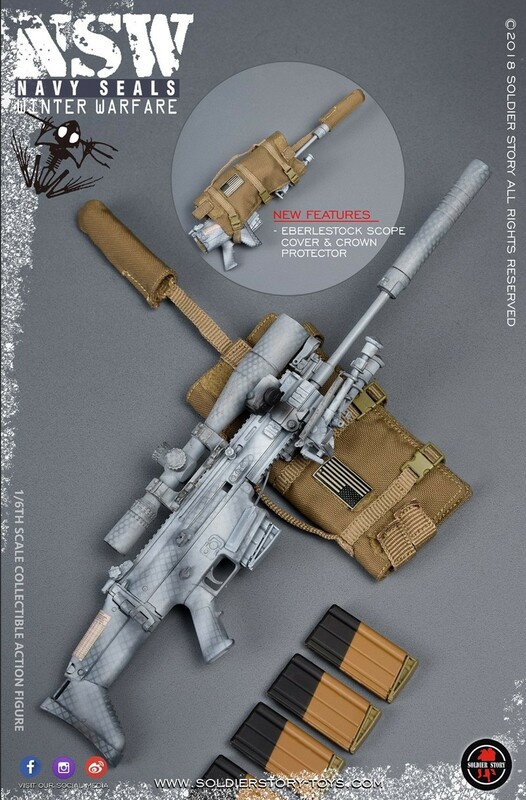 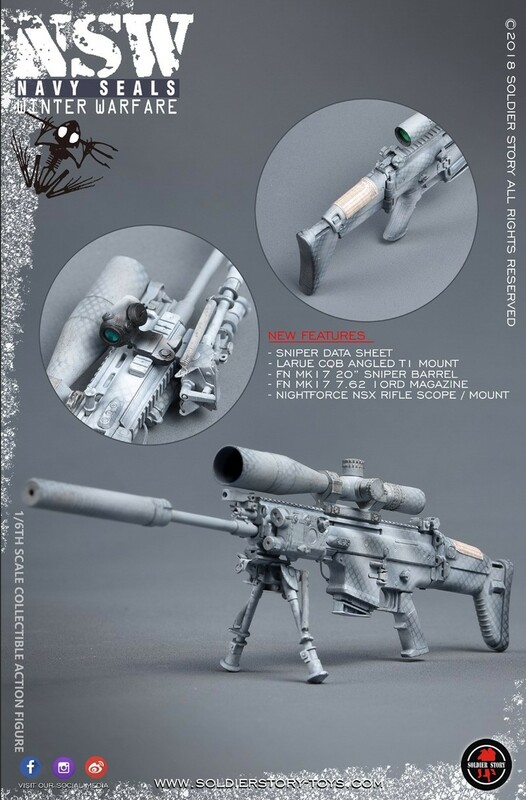 The two rifles could pass for urban warfare camo so they’re in my list too. 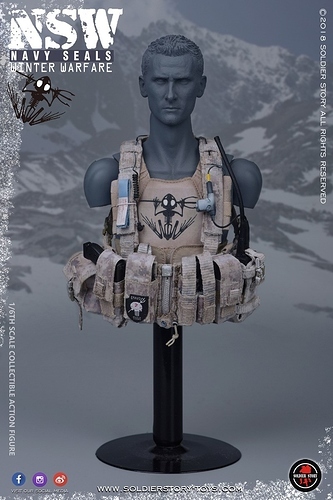 Overall an ubercool set, kudos to SS. I’ll get some pieces too. 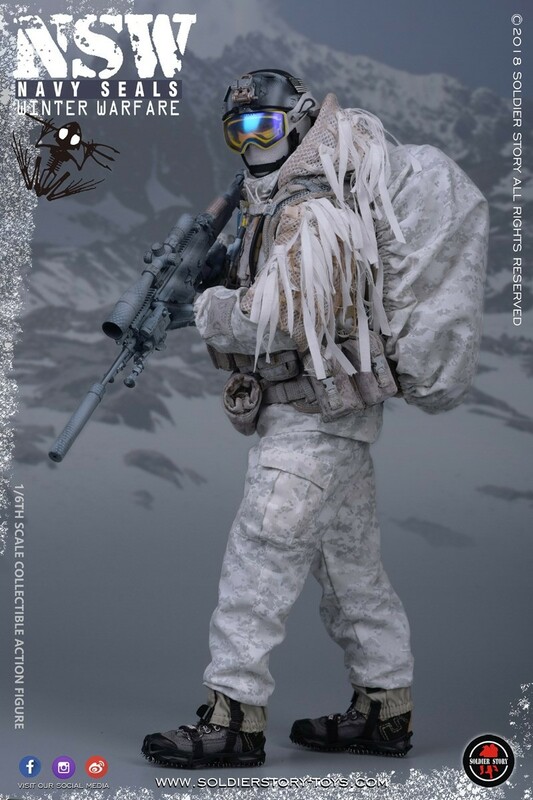 Winter is fine to me here in Germany. 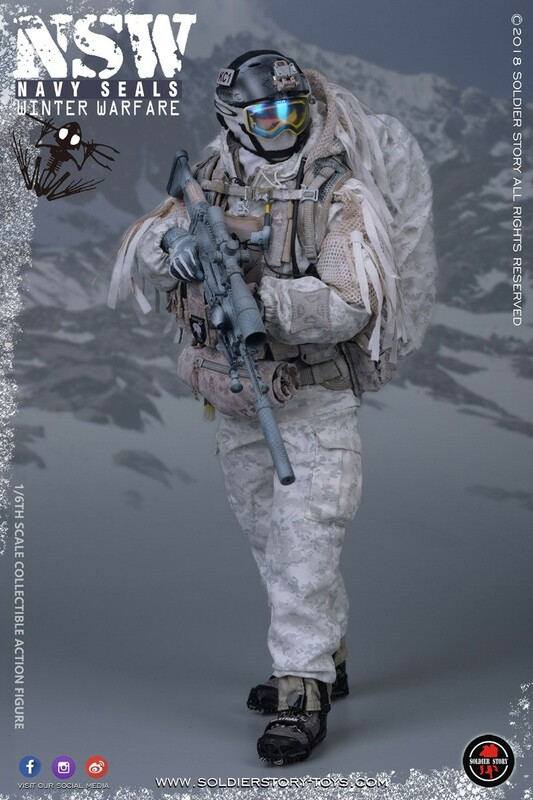 What tropical country you’re talking about? 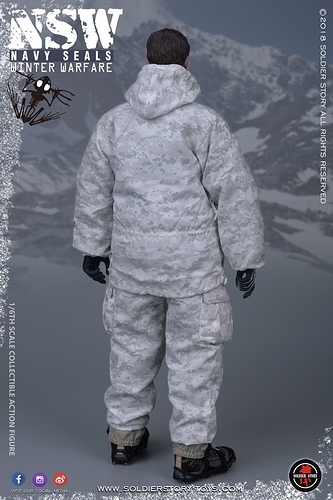 I was really looking forward to a tent. 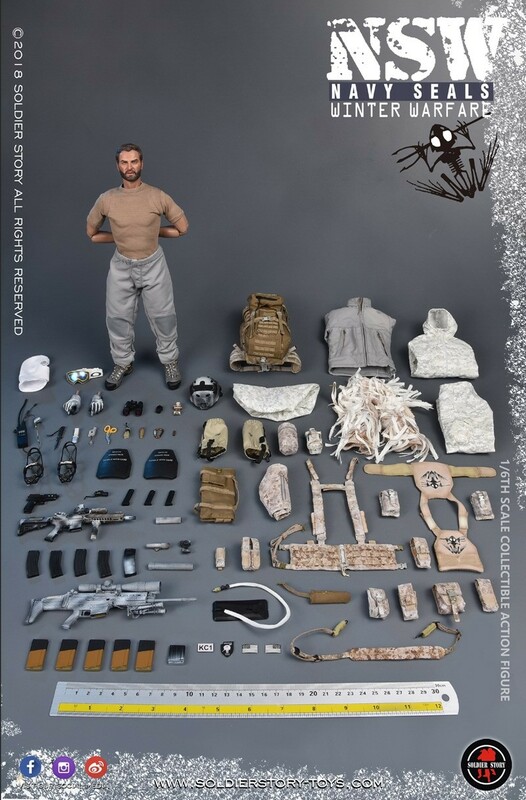 Very impressive figure. This one will be $250 if the trend continues. 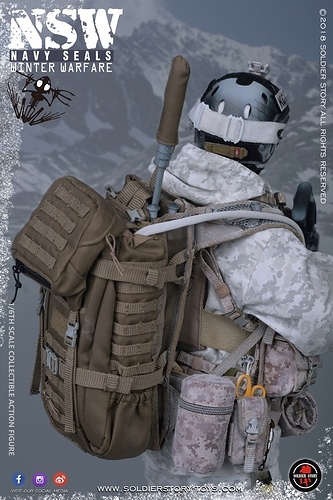 I was momentarily excited by the suppressor cover poking out of the ruck, thinking it was an antenna for a large backpack radio. 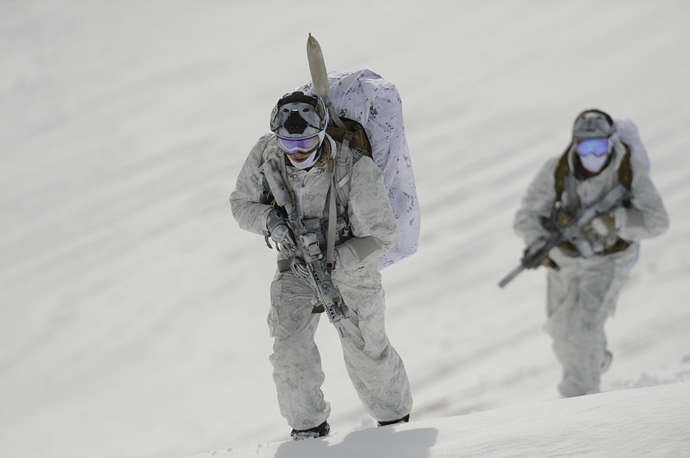 Gotta give Soldier Story credit for the bulky look of all that layered clothing. 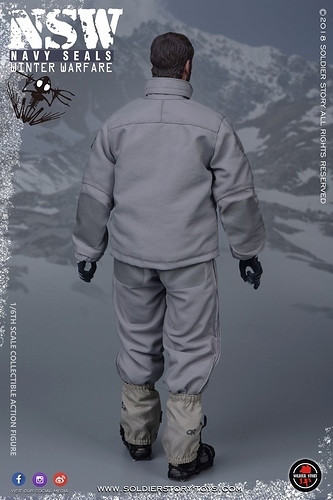 Sort of the reverse of TwistingToyz’s old WW2 Italian snow suit, which is mighty tight. 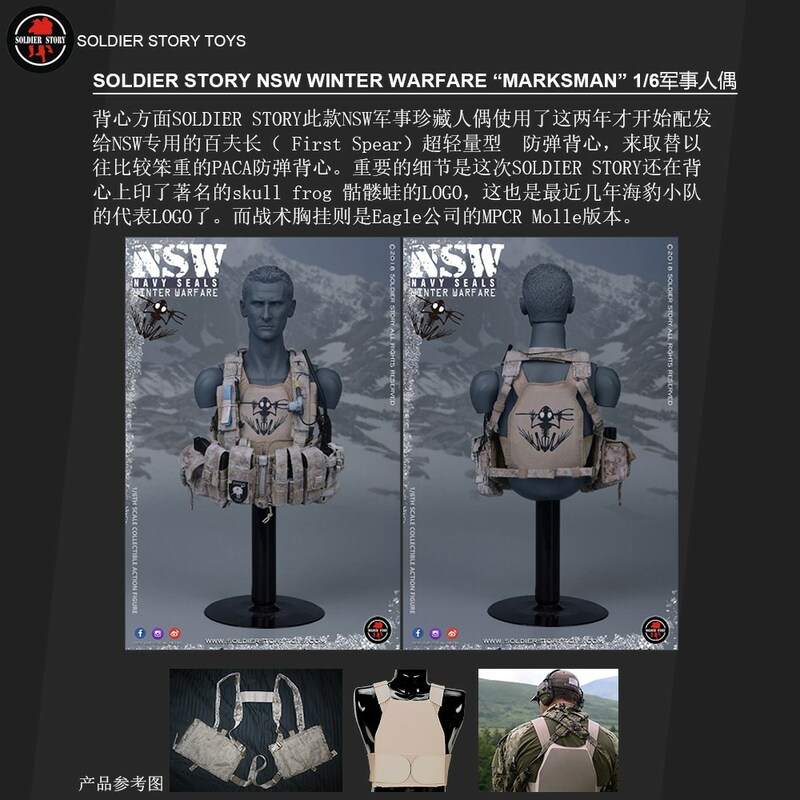 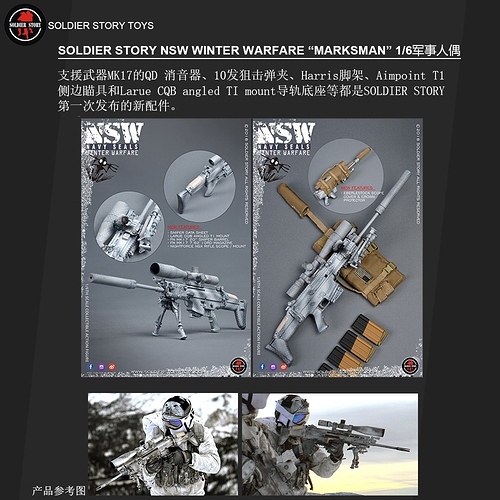 Same price as other recent figures from Soldier Story. 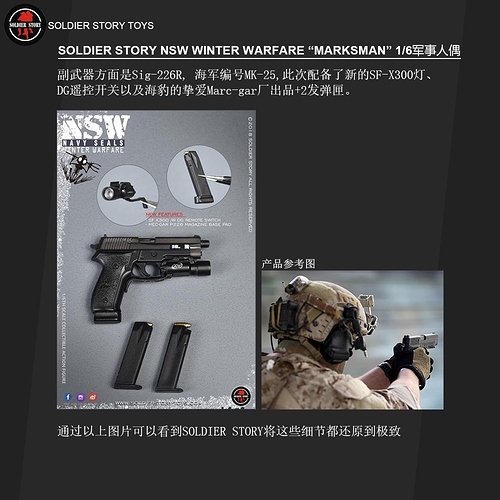 $199.99 is the new $159.99, at least for North America/Europe. At least you get two rifles this time around and a backpack is something you don’t see everyday either. At least you get two rifles this time around and a backpack is something you don’t see everyday either. I thought you wanted that tent? Alas I’ve learned with Soldier Story that you can only expect such things in an expo exclusive. But joking aside, I believe adding the tent and the Fortis Shift to the SS109 would make this even better. 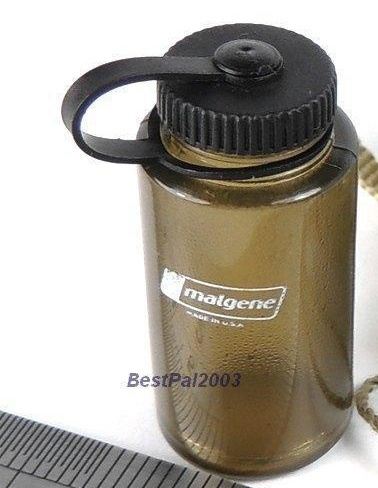 That would be Puerto Rico, smallest of the Greater Antilles in the Caribbean Sea. 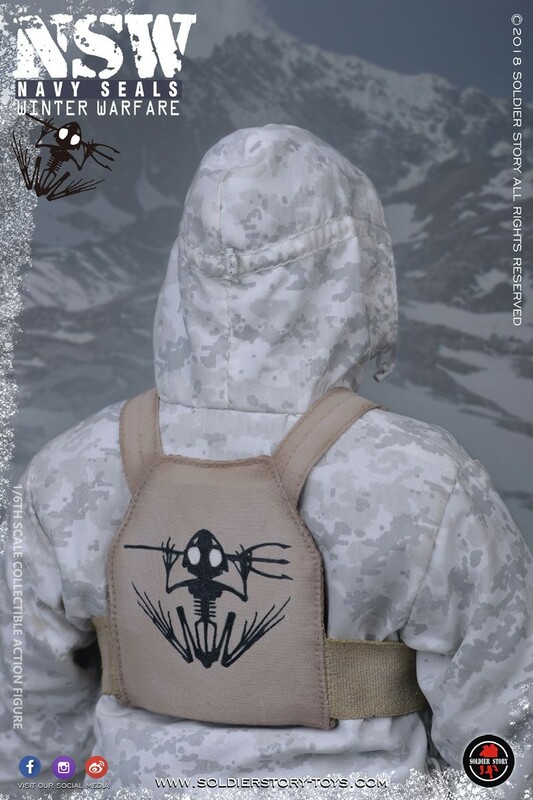 Asi mismo es!!! 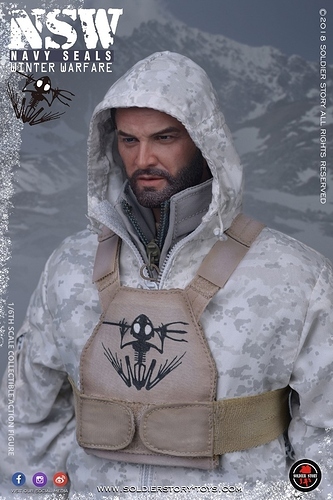 From la Isla del Ecanto! 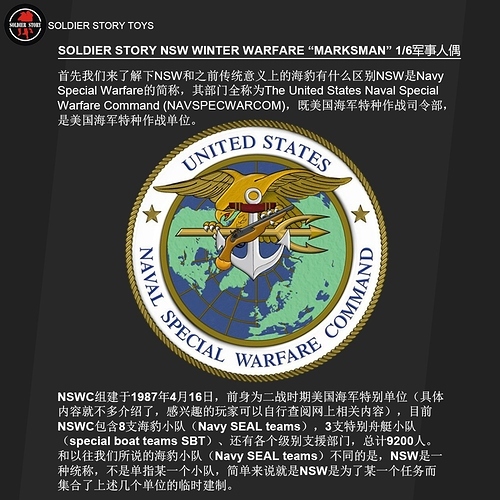 This one will be an awesome release, which will be followed up by 3 consecutive WWII figures from SS. 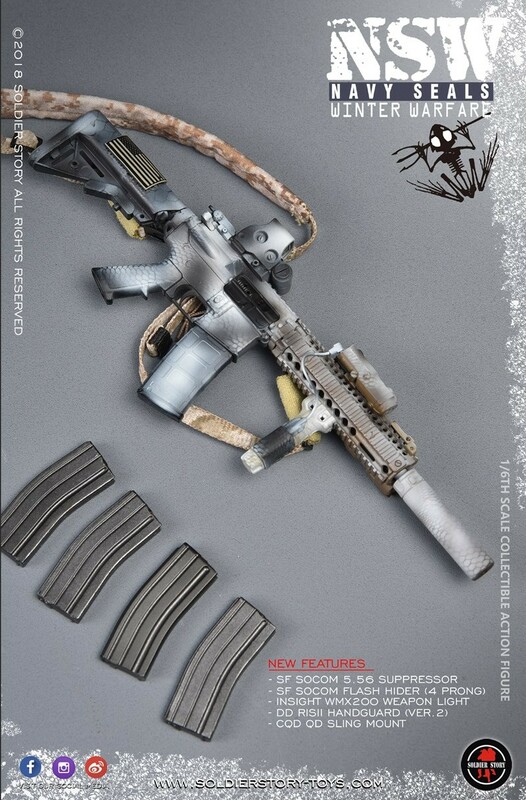 Lots of money to save there.